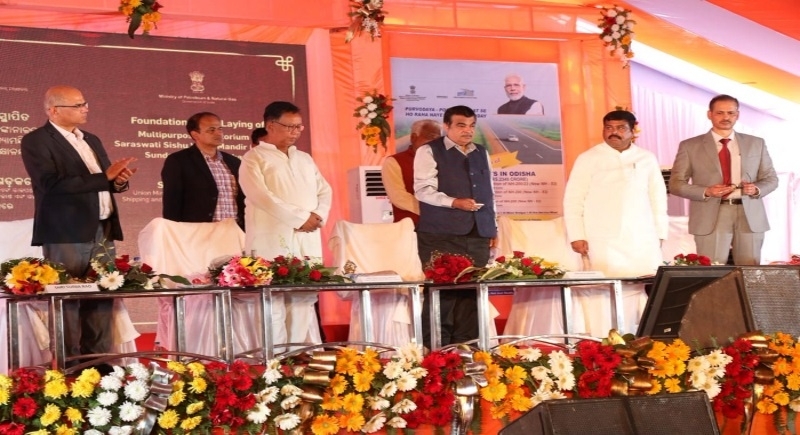 Kamakhyanagar, Odhisha, Feb 6: Union Minister Nitin Gadkari laid the foundation stone for Three National Highway and other development projects in Kamakhyanagar in Odisha. Nitin Gadkari was accompanied by Union Minister Dharmendra Pradhan on this occasion. These NH projects will ensure better connectivity of the mineral-rich Angul and Dhenkanal districts of Odisha with the rest of the state. By reducing traffic congestion and the travel time between places, the projects would help in reducing the operating cost of vehicles and bring down the levels of pollution. All this will help generate employment opportunities in the region and improve the socio-economic condition of the local people. He added, “Three NH projects worth Rs 2,345 Cr will ensure better connectivity in the mineral-rich districts of Angul, Dhenkanal, and Jajpur with rest of Odisha and help generate employment opportunities in the region and will also improve the socio-economic condition of local people. The road starting from Kanaktora in Jharsuguda to Dabri to Chandikhol was declared a National Highway by late Shri.Atal Bihari Vajpayee ji’s Govt. Today the improved NH has been renamed to NH 53 and now it will ensure seamless connectivity and development in the region”. He proudly quoted the finished projects from Odisha and said, “We are 100% corruption free, transport, time-bound, and result oriented”.